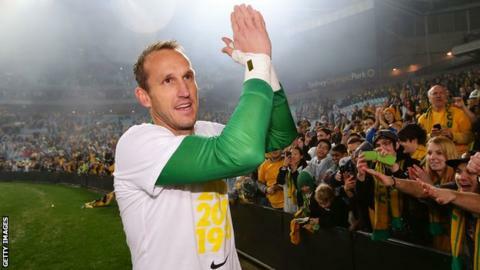 Veteran goalkeeper Mark Schwarzer has joined Chelsea on a one-year deal after leaving neighbours Fulham. The 40-year-old was a free agent after turning down a new contract offer at the Cottagers. The Australian international will provide competition to Petr Cech. "It's a phenomenal club," said Schwarzer. "It's one of the biggest and best clubs in the world and it's an honour to sign for Chelsea. I didn't take much convincing to come here." Schwarzer is the first overseas player to make 500 English top-flight appearances. The Sydney-born stopper moved to England in 1996, with Bradford City. He later joined Middlesbrough, for whom he made more than 400 appearances in 11 years, before switching to Fulham in 2008. He is Chelsea manager Jose Mourinho's third signing of the summer, following Dutch midfielder Marco van Ginkel and Germany international forward Andre Schurrle to Stamford Bridge.